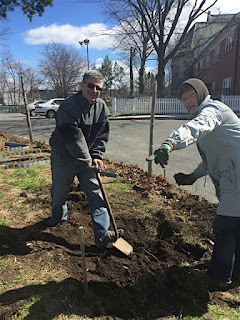 Marcelo and Mark started early taking the soil out of the shaded raised bed. Gabriela joined later and tended the compost pile (for more details see the blog post). Els came later and we were all thrilled to see Solange coming back! She helped relocate the raised bed. Els and Gabriela did some weeding, seeding, and watering. The frame is now in its new and sunnier location and we'll fill it up with soil next time. Composting is picking up steam! On April 21st the active pile was at about 100°F and a week later it was at about 110°F! The middle (maturing) pile is stable at 80°F. Fruits, veggies and tortillas should be cut up. Paper bags are OK but should be cut in small pieces. And everything needs a cover of browns from the right bin! The smaller the better; shoot for no larger than 2 inches. 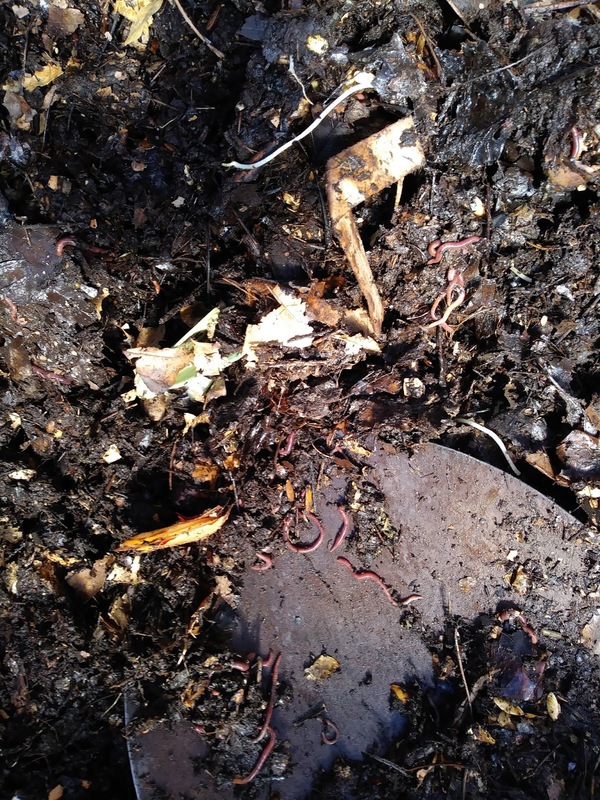 As there are more of us composting, it's important to speed up the process. Size matters! 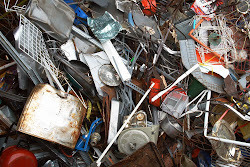 Smaller pieces decompose much faster. It's getting hotter and this is important to reduce odors. When you drop off scraps, cover with equal amount of browns (from rightmost bin). Some good news to wrap up: looks like the trash bin is being used. 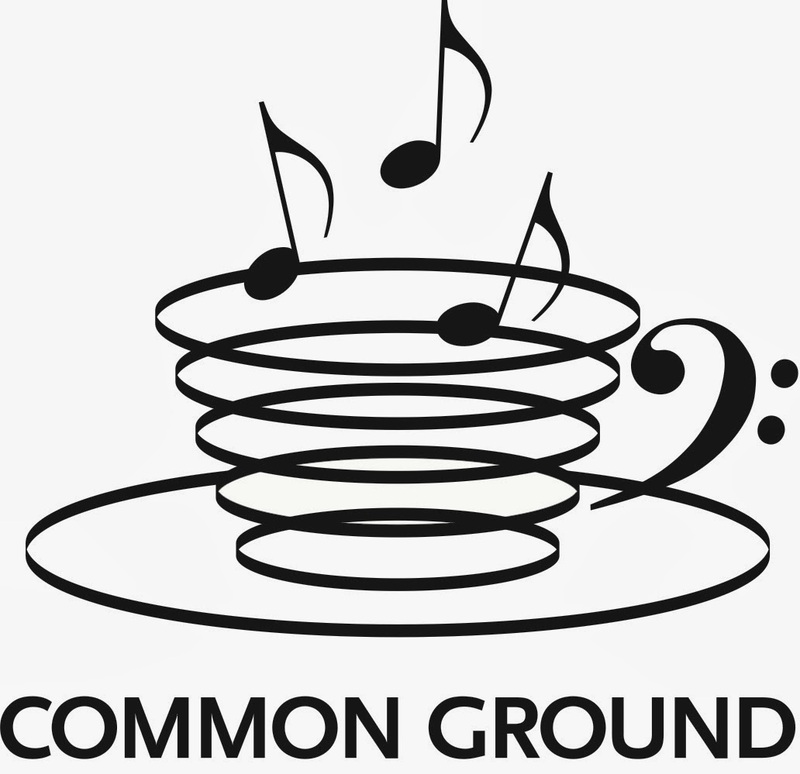 Though some stickers are still making their way to the pile, we seem to be getting better at it! 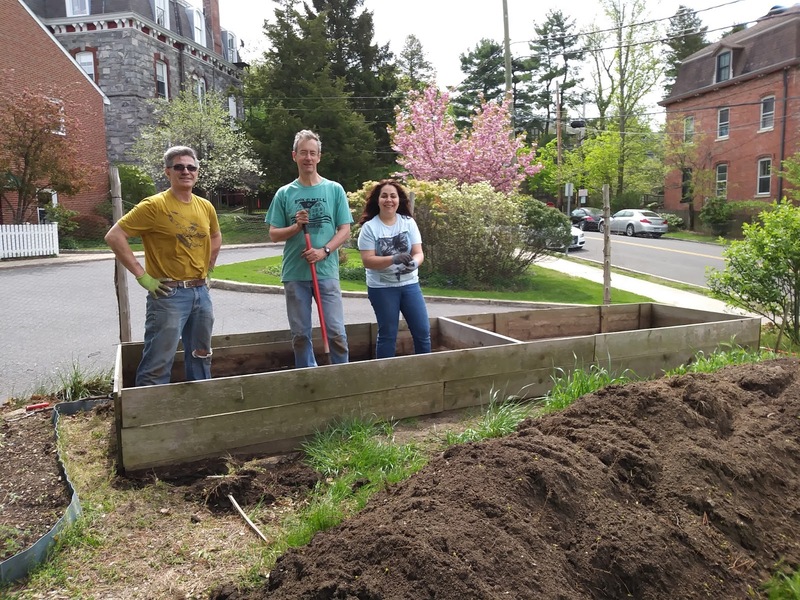 It was a somewhat cool and rainy Earth Day and we had a skeleton crew at the garden: Marcelo, Susan, Laura and Iris. We worked some in our individual plots and also on the front shady boxes. Sam stopped by to add some kitchen scraps to the compost. Marcelo kept working on moving the soil out of the shady bed. Iris chopped the cover crop in the shady bed and added it to the compost. Marcelo is also going to empty this bed in preparation for moving the entire structure to the sunnier side of the garden. 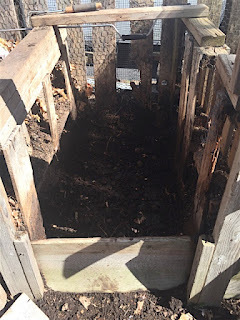 Susan started working on a small extra plot in front of her raised bed, layering cardboard and compost. She discovered some small paw prints in her plot, reminding us that we need to try to tie up the holes and gaps in the fence asap. 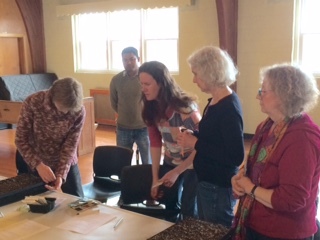 This Saturday Susan, Iris, Laura, Linda H, Mark P, and Gabriela met at the garden. We were busy planting the individual plots, adding compost and watering. 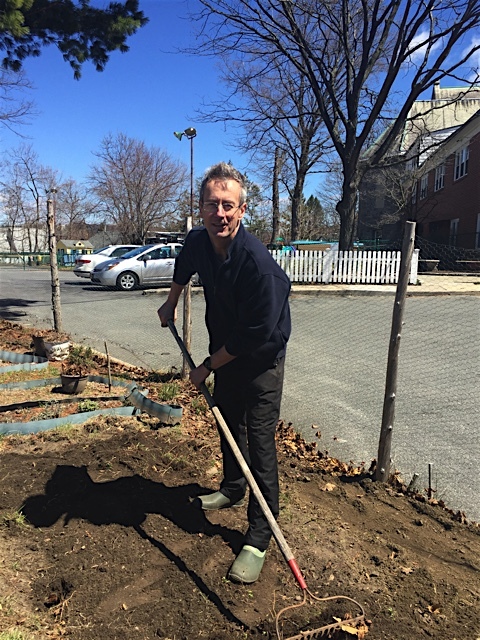 Mark continued to advance the relocation of the shaded beds into a sunnier spot. He transplanted the herbs that came back (sage, thyme, and oregano) to make room for the bed and kept moving soil around and leveling the ground. 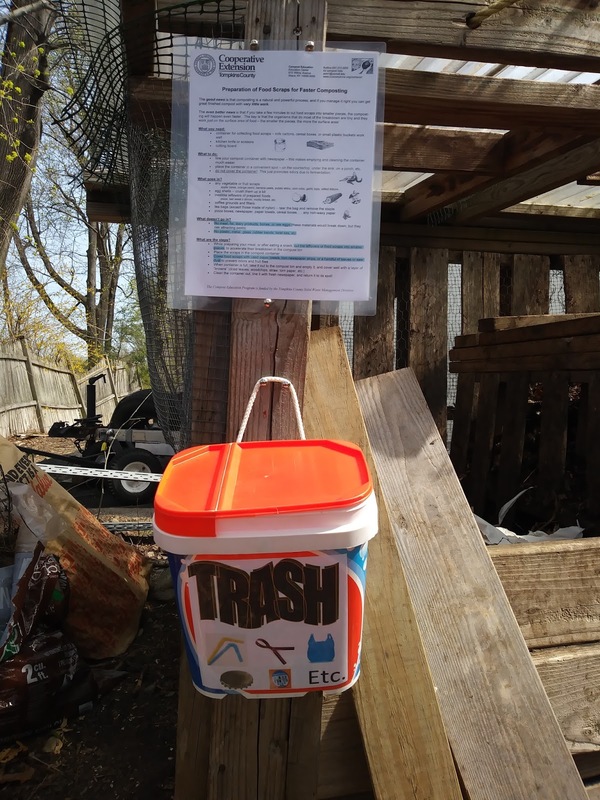 Gabriela also installed new signs and a trash receptacle for the compost bins (for a fuller compost update, see the next blog post below). We were all so intent on what we were doing that no photos were taken! On Friday, Gabriela met with Elisa to touch base on compost pile management now that Kitchen Gardeners will take over during the summer. Elisa took the temperature in the middle bin, which was about 80° F. The active bin was just slightly above ambient temperature, which is expected because the amount of scraps is still rather small. Gabriela also installed new and improved signs (thank you Elisa for re-designing them!) so hopefully these will make it easier to remember all the basic steps! 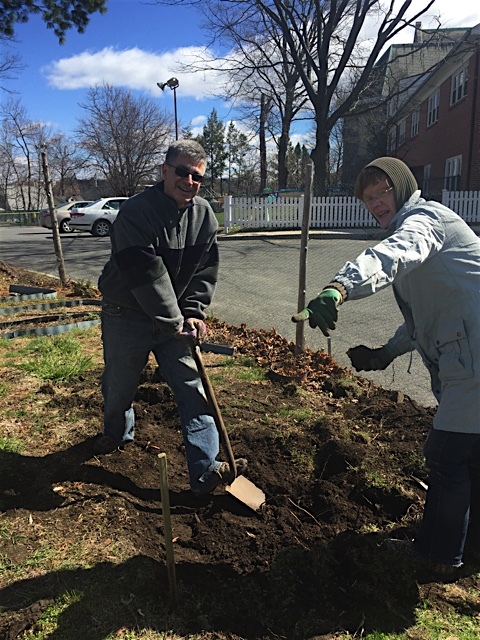 Thank you to all the Kitchen Gardeners that helped turn the compost piles on Saturday, April 8th and make room for more scraps! 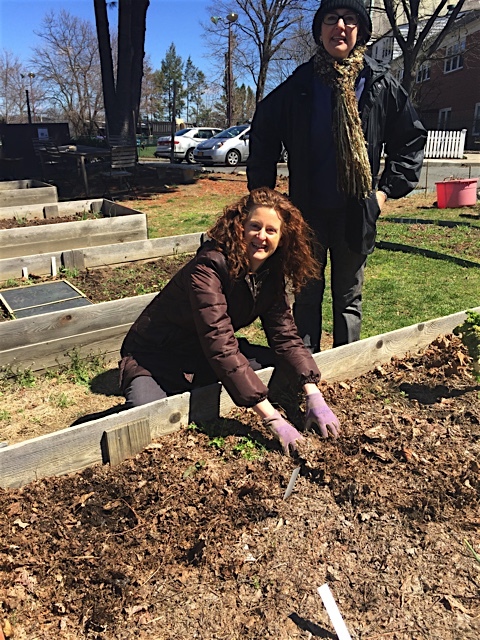 (Marcelo, Iris, Els, Susan, Mark, and Gabriela met for the first gardening day of the season! read the blog post here). 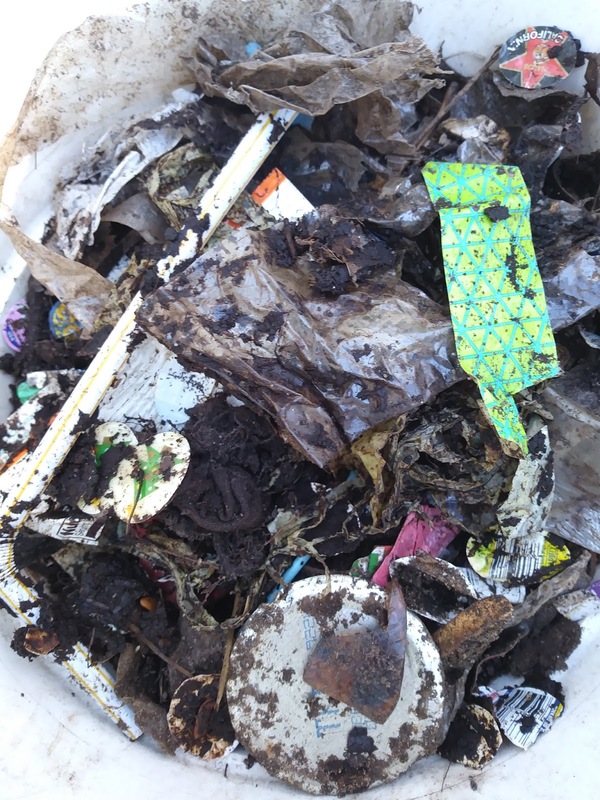 Please redouble your efforts to remove all stickers, rubber bands, twist ties and any other non-compostable items--as you know these will never decompose and create a problem. Tip: it's easy to forget removing these freaking stickers--we've all been there! A helpful tip: remove all labels BEFORE storing your produce, so you'll have to remember to do it only once! helped us turn the compost. The middle pile had been maturing for several months and the compost was ready to use (we'll tell you more about this next week). So we sifted the compost and took it to the garden where it will nourish the soil and plants as we spread it on the planting areas. Once the middle bin was empty, we proceeded to move the active pile (the left one) into the center. This not only created room for new scraps but also allowed us to more thoroughly mix the compost. The middle bin will be now left to mature for several months until it's well decomposed. 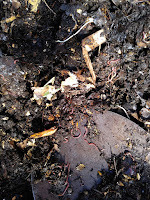 We found lots of worms in the compost--a sign of an active and healthy pile! Elisa will stop by this Friday at 11:30 but Kitchen Gardeners will tend the pile through the gardening season on Saturday mornings between 10 AM and noon. Stop by to say hi, drop your scraps and ask any questions. We'll install new signs that will hopefully be more visible and provide clearer instructions. 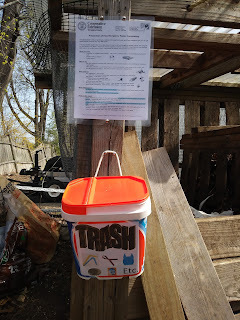 We'll install a trash container where you'll be able to discard any non-compostable items that sneaked in. First Gardening Day of the 2017 Season!! We’ll be meeting at the garden again next week and, if the water is turned on by then, we’ll be able to start planting! For more details on the compost pile see the blog post here. Here’s a pile of beautiful dark soil created from food and garden scraps! 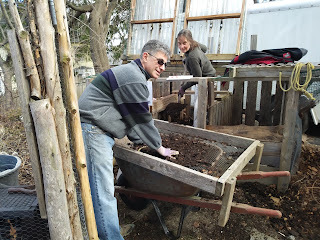 Marcelo and Els began working on creating the area where we plan to move one of our big double-plot raised beds (the one that is currently too shaded). The middle compost bin, emptied of all the good stuff. 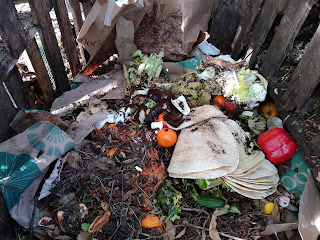 The bin that is in the process of composting with fresh fruit and vegetable scraps, leaves and other garden debris. Gabriela took over the compost bins after Elisa left. Iris made a trellis of string for the snap peas she and Linda H. planted this week. Susan getting started on her plot, checking the layer of ground leaves and looking for overwintering greens. Mark kept working on the area for the new bed. He and Iris wheelbarrowed loads of dirt from the infamous dirt pile to begin to even out the land. They also put the fence back up (it had been moved to allow for piles of snow to be plowed into the garden area). Hopefully the deer who discovered the garden while the fence was down will be discouraged from making it a regular lunch spot. 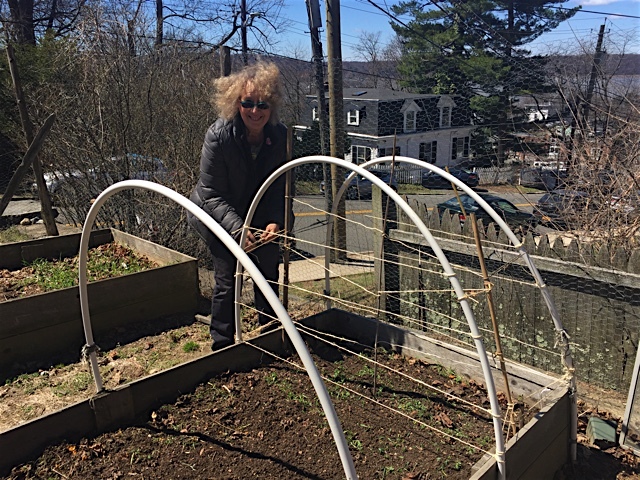 Kathy Puffer, a gardener and educator trained in permaculture, led a fun, hands-on workshop on Saturday, April 1st, 10 AM - noon at South Church. 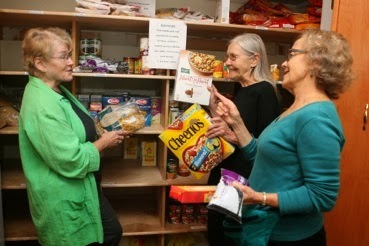 We worked together and got our hands dirty under Kathy's guidance. We made our own seed starting mix using sustainable materials and learned how to ensure adequate moisture while avoiding seed rotting. Everyone took home a seed starting tray. And . . . on another note, read about Kathy Puffer's story here, and her home biodigester which produces biogas for cooking from food scraps! Roots & Wings CSA members get more than fresh vegetables and fruit from a local farmer. They also have access to community composting behind South Presbyterian Church in Dobbs Ferry. When CSA members gather to meet the farmer’s truck on Sunday mornings in the parking lot behind South Church, many bring a container of their vegetable scraps to the compost bins located there. 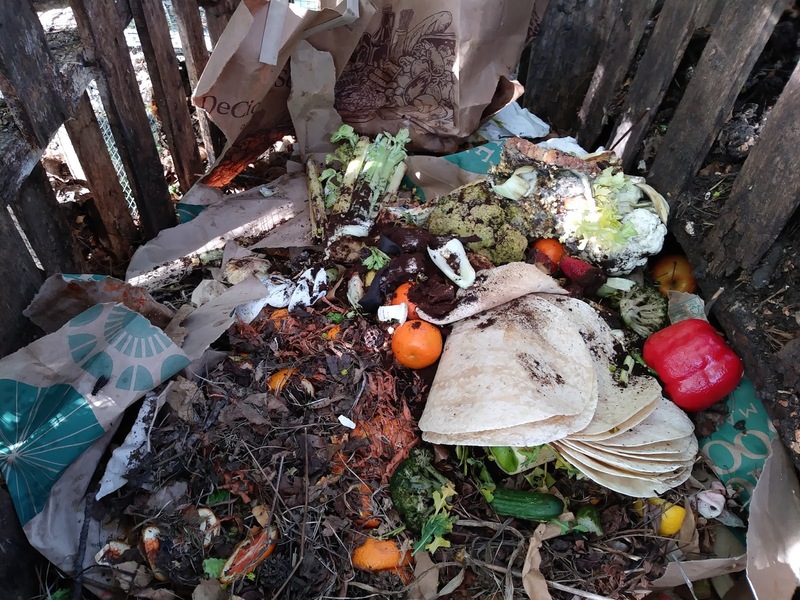 The benefits are two-fold: They keep vegetable scraps out of the waste stream and help create nutrient rich compost for gardens in the river towns. 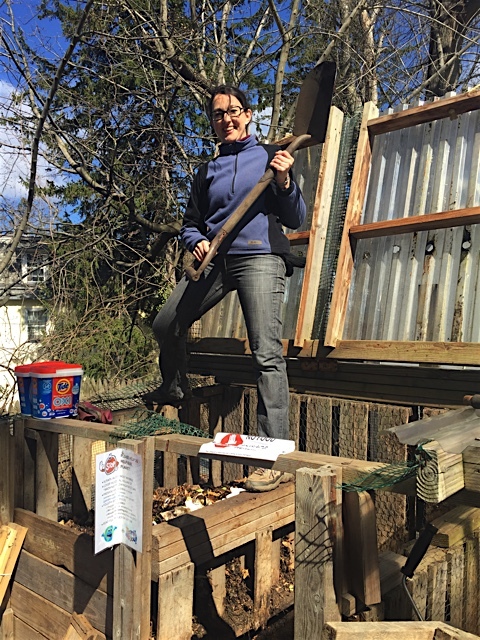 To keep the compost pest-free, Roots & Wings requires new composters to take a free introductory session with Elisa Zazzera, a master composter from Hastings, who also maintains the health of the bins. The sessions are offered about once a month. The compost bins are spacious and accommodate not only CSA members’ compost but the vegetable scraps and coffee grounds from South Presbyterian Church’s campus—such as kale stems from the recent Mardi Gras gala. 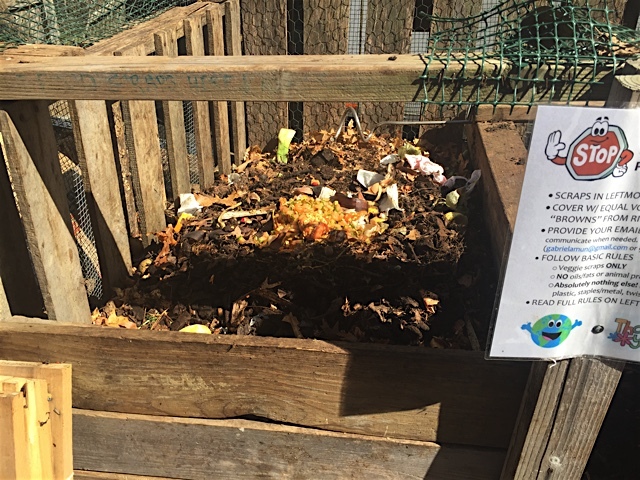 Bev Roche, a chef at Days of Wonder, located on the campus, will be begin composting the daycare’s vegetable waste with Roots & Wings this spring. “Because all the meals I do are plant-based, I generate a large amount of vegetable waste. It feels so bad to put them in the garbage. 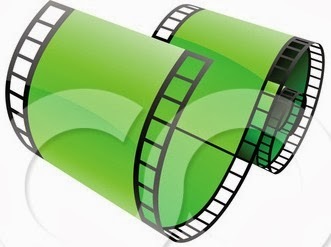 Plus, I love the idea of introducing the toddlers to composting,” said Roche.